"All persons in Canada have the fundamental right, as embodied in the nation's Bill of Rights and the Canadian Charter of Rights and Freedoms, to have access to all expressions of knowledge, creativity and intellectual activity, and to express their thoughts publicly. This right to intellectual freedom, under the law, is essential to the health and development of Canadian society." Taken from the Canadian Library Association's statement on intellectual freedom. 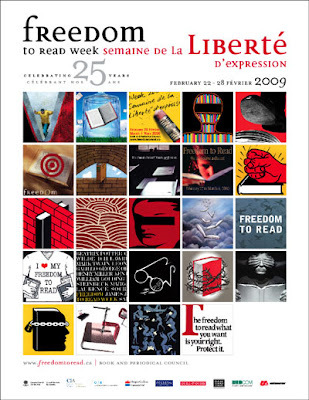 February 22-28 is "Freedom To Read Week" in Canada. It is an annual event, ongoing now for 25 years, meant to encourage Canadians to think about and reaffirm our commitment to intellectual freedom which is guaranteed to us under our Charter of Rights and Freedoms. If you are in Canada, then it is very likely that your local library is hosting events this week to recognize Freedom to Read Week. You can also check the website at www.freedomtoread.ca. Read more about censorship, freedom of expression, challenged books, and historic bannings and burnings. Occasionally a bit of censorship just makes me laugh out loud: In the 1980s, during a examination of school learning materials, the London County Council in England banned Beatrix Potter's children's classics, The Tale of Peter Rabbit and Benjamin Bunny, from all London schools because the stories portrayed only "middle-class rabbits." everyone knows it is bad form to eat a poor rabbit (not enough meat and flavor) and the middle class is all that keeps the species going as the upper class rabbit- you know the best is a superior meat for dumplings. What a great thing to celebrate every year. Thanks for bringing it to our attention.